Hummingbirds are showing up weeks early as far north as Canada already this year, but hummingbird watchers think it’s mainly the ambitious, young males looking shooting out ahead of the flock and secure excellent mating territory. In the last week they’ve reached into northern Nova Scotia, the upper peninsula of Michigan and parts of Minnesota. Lanny Chambers, who runs hummingbirds.net says hummingbirders have been debating what’s going on with this freakishly early migration of ruby-throated hummingbirds and the consensus is that most of the birds are still sensibly waiting down south to be sure they don’t get caught in cold weather. In many other species it’s the young male pioneers that are always the ones wandering out early and far, hoping to get ahead. All of the manatees caught way up north in recent years, for example, have been males. In hummingbird world, the males head north first to stake out a good territory. “I would be surprised if people were spotting females north of their normal ranges,” Chambers says. They have no reason to go early. They don’t have a regular mate or family structure; it’s every hummingbird for itself. The females “pick males that are the orneriest, nastiest” birds defending good territory, he says. 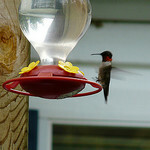 Another hummingbird tracker, Learner.org, has done a very cool animation of the migration data. Even though they employs school kids as citizen scientists–and so have a completely independent set of information–they show the same thing as hummingbird.net: a very early start to a migration, but the bulk of birds still hanging back in the south until it’s a sane time to head north. Chambers says that some hummingbirds probably try to head north early every year, but storms stop them. They just go hide in the bushes. Hummingbirds are tougher than their delicate frames suggest, he says. “They can take a night or two of temperatures in the teens,” he says. “Twenty degrees isn’t a problem. They may be uncomfortable, but they’ll be okay.” Their main food isn’t flower nectar (or the Kool-Aid like drink people put out for them); it’s bugs. Is the Noose Closing on the Central Park Coyote?